Whether you’re visiting Catalonia with children or you you’d just like to release your inner big kid for the day then PortAventura Theme Park is the perfect day trip from Barcelona for you. Located near Salou on the Costa Dorada, you’re sure to have an exhilarating time as this is one of Spain’s top theme parks. Rides range from some of the tallest roller coasters in Europe to attractions especially designed for the younger ones. There is even an exciting water park which is ideal for those hot summer days in Barcelona. Come along for the ride as we give you an insight into this awesome theme park just an hour from Barcelona, and its amazing shows and performances. 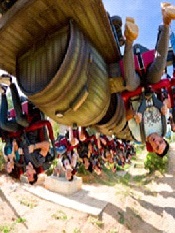 PortAventura has six different theme areas, each with its own unique atmosphere. Take a stroll through Mexico and see ancient Mayan ruins, or head over to the Far West and experience a real American Western town… But the journey doesn’t stop there! There are also the Polynesia, China and Mediterranean areas to discover, as well as the SésamoAventura zone for the really younger ones. There’s such a wide variety of attractions at PortAventura that you’re sure to find a favorite ride, so here are some of the most popular to get you started: – The Shambhala, the tallest roller coaster in Europe, always seems to get the adrenaline flowing. – The Furious Baco will catapult you high above the ground. – The Tutuki Splash, a dormant volcano, will soak you. If you are exploring with young kids, check out the Sesame Street themed area with tons of exciting rides. If you’d like to cool off and try out some huge slides and wave pools then check out the Costa Caribe Aquatic Park of PortAventura, which spans over 50,000 square meters. Parents can relax by the Paradise Beach pool listening to reggae music while the kids tackle the King Khajuna water slide. This water park is a must after a long, hot day of exploring everything else that PortAventura has to offer. Plenty of spectacular shows and performances take place throughout PortAventura theme park at different times of the day, although the most popular demonstrations happen in the evenings. 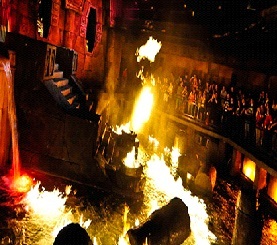 These include the Temple of Fire and the Bang Bang West Show for something the whole family can enjoy together. The Cirque du Soleil is even known to make appearances at the park occasionally! Check the park’s calendar for seasonal special events, such as their Halloween theme, too. 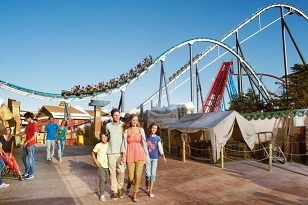 PortAventura is located about an hour outside of Barcelona by train. You can get a direct train from Estació de França, Passeig de Gràcia or Sants. To make it easy, you can buy your train ticket and theme park entry ticket together at the train station. Prices for tickets start at around 45€ for adults and 39€ for children. If you buy passes for more than one day you’ll receive a discount. For more information, visit the PortAventura website. This entry was posted in Activities, Home, Things to do and tagged barcelona activities, Barcelona activities for children, barcelona day trip, barcelona entertainment, barcelona with kids, portaventura barcelona, portaventura theme park, theme parks barcelona, travelling around barcelona. Bookmark the permalink.